Your lifepath is your life purpose, or spiritual job description while you’re on the planet. It’s revealed by your date of birth, and is a number between 1-9, or 11, 22 or 33 (the latter are Master Number lifepaths – some people include 44). We change lifepaths each lifetime, depending on what we want to teach and learn about. Your birth and current name/s, pinnacles, challenges and personal years also influence your opportunities. I cover these in psychic readings as well as numerology workshops in Brisbane (online classes are in the works). This post is dedicated to the 9’s who’ve helped me, as well as everyone who loves this number of compassion. Thank you Forrest, Helen Wang, Penny Lake, Aunty Beatrice, C & J, Jody, Dave Stringer, Tania, Marilyn, Glenda Hodge, Ms Ti, Karina (Infinite Potential Centre), Rob from SpiritSong, Leith James, Leith J., Tanya Targett, Elissa Freeman, Emma Nolan/ Emma Jean Photography, Bob, Natasha Nanda (11:11 author – see our interview) and Louise Corran. BTW, I struggled to publish this 3300 word blog, because my brain kept saying ‘sell it as a book!’. In true 9’er style, I am giving it away for now, so more people can access it. Having a baby really does soften you up. To send feedback on this article, email me with Lifepath 9 as the subject. I’m always open to idea. To stay in touch, join me on facebook at The Numbers Queen or Lifepath 11. You can also sign up for articles on my homepage. How do I know if I am a lifepath 9 (aka 9 lifepath)? 9 looks like someone with a big head – thoughtful and intelligent. This energy is about empathy, insight and helping people to learn about consequences. Numbers go from 1 to 9 so 9’s act like a big brother or big sister to others. 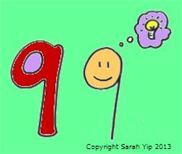 Think of 9 as an ‘umbrella’ lifepath, that other numbers seek out for protection when it rains! No wonder so many emergency hotlines contain 9 (e.g. 911, which is the Angel Number for help – read more). That’s why I say “when you’re at a finish line, find a 9,” Not only will you receive help on how to ‘let go and let God*’, you’ll help the 9’er build up good karma. *I follow Julia Cameron’s philosophy that God is Good. Orderly. Direction., rather than male or female. To me, seeing 11:11 is a hello from God, aka Source or Oneness. Why do you call 9’s old Souls? In my experience, someone with a 9 lifepath is an old Soul*, who has been to Earth many times. Their life is marked by deja vu, synchronicities and a sense of purpose. 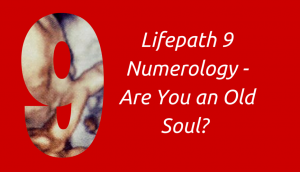 You can be an old Soul without 9 numerology, but that’s less common. *Unfortunately, the term ‘old Soul’ is overused in the new age industry, which can be confusing. We are all infinite beings with numerous past lives. In this case, I use ‘old Soul’ to identify a Soul who’s chosen a human form multiple times. You could also call these people well-travelled Souls.Although some people, including my younger self, suggest that 9 lifepaths ‘may not come back’ or are ‘finishing their lifetimes on Earth’ I hesitate to say this now. It makes sound it like coming to Earth is a punishment, and I feel it’s more like a University or School. Here are some articles I found – funnily enough, they have 9 and 18 in their titles! See 9 Signs You’re An Old Soul and Young Body, Old Soul – 18 Things Every Old Soul Knows to Be True.The photo in the 9 image at the top of the page is my son Forrest in the womb – he’s always looked like a little old man! Read more. Remember, there are other dimensions, including realms where we’re all trees or animals (they can be quite relaxing!) After learning past life regression with Toni Reilly, I’ve had flashbacks to being a bird-like creature in at least one incarnation. Trippy, I know. Here’s a podcast with Toni that discusses past lives. Or see Mary Rodwell’s work with ACERN if you or your children have had contact with ET’s in-person or while meditating.As an ex-scientist, I think it’s illogical to believe that we are the most, or the only, intelligent life in the Universe. Open your third eyes folks! What if I’m not a 9 lifepath, but relate to this article?If you have been drawn to this article, you probably have 9’s in your chart or around you (as family and friends). Wherever 9 appears, is where the Universe wants you to think bigger. 9 even looks like a magnifying glass. As a 29/11 lifepath, I attract people with 9 energy as it’s one of the chakras I am healing in this lifetime, along with the 2nd chakra). 9 energy affects everyone, irrespective of their lifepath. -name/s e.g. Louise adds to 27/9 and Yoda adds to 18/9. Archangels Ariel, Gabriel and Chamuel are the protectors of 9 lifepaths – read more. Work out your name numerology using the Pythagorean system here. There are also calculators online, which have varying accuracy.-personal years and pinnacles. Everyone has a 9 year during their 9 year cycle, when they act like a 9 Lifepath. I had mine last year and it was a whopper – I finally healed my orthorexia, fell pregnant and had to take someone to court Find your personal year-house number, address, phone numbers, licence plates etc. Read more on addresses. Seeing 9, 99, 909 or 999 indicates that you’re completing a phase of evolution (see this article on 11:11 and repeating numbers).-family tree or social circle (your parents, siblings, partner, children, friends, boss, colleagues, teachers etc.) Seeing 911 can also indicate you have 9 or 11 numerology, and medical/ healing capabilities. True story – in my last numerology talk before Forrest was born, I said ‘I still don’t understand 9’s very well’. Of course, he turned out to be an 18/9! We always get what we need. In my psychic readings, I read compatibility by adding lifepaths together. When you add 9 and any number, it reduces to the same number, e.g. an 8 lifepath + a 9 lifepath = 17, which reduces to 8. A 3 lifepath + a 9 lifepath = 12, which reduces to 3. 9 lifepaths often share their energy to help other people work their purpose. They need to remember the motto ‘a hand up, not a handout’. Interdependence is healthier than co-dependence. 9’s can lose themselves in relationships, due to overthinking (analysis paralysis) or its physical equivalent, overdrinking (see my metaphysical take on alcoholism). There’s a fine line between being a healer-in-training and constantly sick. It’s good for 9’s to seek advice of those who have been there and done that, for example a 7 lifepath – they know all about trial and error. 9’s often attract 9’s as partners, which can work well if both are generous sorts. Love brings great blessings to 9’s who choose wisely. A secure home life gives them the platform they need to create peace on the planet. Note: these features apply to a lesser degree if 9 is in your name, etc. -9 represents the 9th/ Soul Blueprint Chakra, which invites us to rewrite history. When I said this to a 9 lifepath client, she laughed because she was an archaeologist who wrote history. I find that 9 lifepaths respond well to subconscious healing such as past life regression and kinesiology, because many of their talents and phobias come from other lives. 9’s seem to choose situations where they will be mixed-race, an eldest or only child, or born to parents after a miscarriage or trauma (so their birth alone is a healing). They have a tendency to work and travel overseas, to speak other languages, and to marry outside their cultures or family expectations. -All 9 lifepath are perceptive, often ‘beyond psychic’, as they know humanity so well. They see the ball coming before it’s even been thrown. Think of someone who’s lived in a country so long they act as a tour guide for visitors. They are a ‘local’ on Earth. What they dream of or ask for during prayer, often comes true. My friend Penny (a 36/9 lifepath) is amazing. When I had a Breakfast at Tiffany’s party, I couldn’t find any earrings. Penny mailed the right ones the week beforehand, without knowing about the event. When I needed a black bra to decorate for Tahitian dance, she sent one, without me telling her anything. Another time, Penny’s shoes broke while we were walking. I said ‘you can’t walk barefoot’ but she just smiled. Minutes later, we found a pair of pink flip-flops (her favourite colour) on the road, which she put on. She’s the one who taught me that ‘what the mind conceives, it can achieve’. More on manifesting miracles. -9’s are often in the right place at the right time (depending on whether you choose to think positively). Once, I was standing with friends at Mind Body Spirit Festival, and said ‘Haha, we are 28/10/1, 29/11 and 30/3 lifepaths. Now we just need a 27/9.’ At that moment, reflexologist Glenda Hodge walked over. She is a 27/9. -They are serious, holistic thinkers who make natural psychologists, artists, detectives, teachers and advisors. They magnify other people’s strengths and weaknesses, encouraging truth and healing in any situation. Their willingness to sacrifice themselves for a cause is equal only to the 33 lifepaths. Like 1 lifepaths, 9’s are Spiritual Warriors. They work well in life or death situations because of their leadership skills and thick skin under pressure. ELEPHANT adds to 36/9 and 9’s always protect their herd/ tribe. -Words like LOVE (18/9), REAL (18/9), EGO (18/9), DANCE (18/9) WITCH (27/9), SCHOOL (27/9), MONEY (27/9) and MERMAID (36/9) add to 9 in numerology (see the system I use). More on 18/9 numerology. 9 energy is about the big stuff! Love, money, spirituality and separating fantasy from reality. Like people with Master Numbers 11, 22 and 33, 9’s are ‘sent’ to families, workplaces and communities to increase tolerance and diversity. For example, they could be the only gay son in a conservative Asian family – see the note about Ricky Martin. Remember, the word WITCH adds to 27/9 – these were women and men willing to step outside the norm to be healers, midwives and psychics despite the danger to their own lives. If you have 9 energy, people trust you, but you must overcome your scepticism of authority, money and love to succeed. Find role models who lead with integrity and earn a living ethically, because we need more rich spiritual people in this world! See my thoughts on manifesting money and overcoming bullying. -9’s can appear over-sensitive and idealistic, as they expect you to be as committed and mature as them. When they find this is not the case, they get upset and retreat into a shell (after all, the ninth Major Arcana of the Tarot is The Hermit) and stop communicating. This tendency to be the ‘strong, silent’ type can lead to depressive symptoms and a sense of heaviness, which could create head-, neck-, shoulder and backaches (the number 9 looks like Rodin’s sculpture The Thinker in a way). Massage, gardening, music or sound healing, yoga, sport and dance can help – 9’s need exercise to stay balanced. -9’s attract early responsibilities such as caring for others or being in the spotlight as children or young adults. 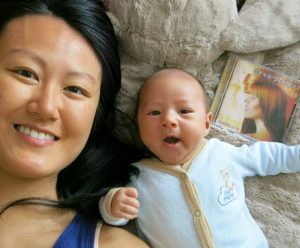 These are the children with knowing eyes, who exude confidence (see the picture of me and Forrest, my 9 lifepath son – he’s only 7 weeks old in this photo). This can leave them susceptible to peer pressure (they’re used to listening to others, being ‘on show’ and ‘looking good’). As a result, substance abuse, poor health practices (e.g. overdosing on junk food/ facebook/ TV/ video games) and rebelliousness can be an issue. Some might say this is how 9’s reach the masses – they have to go ‘undercover’ and act like their target audience. Kris and I are doing our best to give Forrest a good start, because I know he’s got a big life planned. -9’s may become fanatical and take themselves too seriously, if they are exposed to extreme religious or atheist views. There can be a fear of trusting their intuition, despite this being the only path to freedom. Some people associate 9 energy with Mars, the God of War – they can certainly appear fierce and militaristic, at least on the outside. 9’s thrive when they offer help when asked, rather than 24/7. Otherwise they end up battle-weary and frustrated. -They need to cultivate rainbow thinking, rather than falling into black-and-white, us-and-them approaches. It’s imperative that they have creative hobbies and socialise, rather than working or studying all the time. In this way, they are similar to Master 11, 22 and 33 holders, who are here to teach left- and right-brain integration. We don’t need more martyrs or human do-ings. People aren’t motivated by pain. They want to know what love is. Dan Millman suggests that 27/9 lifepaths need physical exercise to stay in touch with reality. I agree – there’s nothing sadder than a 9 who is so jaded that they give up on their body and purpose. Think of Homer Simpson with his kind heart, donuts and beer. Albert Espinosa, Screenwriter and artist – he switched from engineering to cinema at 27, a true 11:11 flipper! Cory Monteith, Actor, who sadly passed away from substance abuse – see the 27 Club below. Jung Chang, Author – see my psychic reading for her, whose book Wild Swans introduced millions of readers, including myself to Chinese history. Her description of foot-binding, concubines and the Cultural Revolution helped me to connect with my ancestors. Jordan Peterson, Rockstar psychologist. He married his wife around his lifepath turning point of 27, and also started publishing his most popular academic papers. Kirsten Dunst, Actor, she had great maturity even as a child in Interview with a Vampire. Louise Hay, Founder of Hay House, known for her book You Can Heal Your Life, and charity towards AIDs-affected people. I admire Louise’s courage and compassion, but have mixed feelings about her company, see this post. Sharon Stone, Actor, she was a wakeup call for female sexuality on screen in the 1990’s. Camilla Parker Bowles, now Duchess of Cornwall – you can see the theme of surrender and letting go throughout her life. Jamie Oliver, Heston Blumenthal (he shares a birthday with Jamie) and Rachel Khoo, Chefs – Well, food is medicine for the hordes – people listen to cooks more than politicians these days. Lance Armstrong, Athlete, his fall from grace could have been a lesson to others that cheats always get caught. There are so many artists who are 9’s I’ve given them their own section. I guess, if it was one of your last incarnations, wouldn’t you want to rock out in a big way? 18/9 Lifepaths – Tom Petty (Oct 2017 update – R.I.P to this legend – how I love his cover of While My Guitar Gently Weeps. He was the same lifepath as my young son Forrest, who absolutely loves guitar and music). 36/9 Lifepaths – Adele (known for taking time out for motherhood which is unheard of for female popstars), Ben Harper, Andrea Bocelli (the blind singer), Dave Stringer (mantra singer – see my review of his Kirtan Flight School) and Whitney Houston (known for her tumultuous love life and addictions). If you’ve heard of ‘The 27 Club‘ of performers who died young, you may be surprised to know that many of them were 27/9 or 28/10/1 lifepaths. Alcoholism and drugs were often a factor, which makes sense as 9’s can seek escapism from their busy heads. When we reach our ‘lifepath age’, we can face tests of faith and purpose – at 29, I discovered numerology at 29 and was making the difficult transition into psychic work – hence my orthorexia. It can be the best of times and the hardest. Singer Ricky Martin had his breakthrough at 27, when he performed La Copa de la Vida at the FIFA World Cup. The next year, his first English language album became the most successful album debut on the Billboard charts by a Hispanic artist. His sexuality came under scrutiny, leading him to ‘out’ himself in 2010. Interestingly, his ex-girlfriend was a 29/11 lifepath. Prince Charles is also a 29/11 lifepath. Lifepath 9s and 11s seem to attract – they both need to overcome their people-pleasing traits, in order to start their form of revolution. I’ve had 9’s ask if they are destined to die young. The answer is NO. It’s just that 9’s are over-represented in Hollywood, which is major burnout territory. MANY lifepath 9’s live to a ripe old age. Please know that addiction, sickness and death are not failures. They are simply experiences. We come here for a reason – some Souls ‘finish their assignments’ quickly, then go home. Other Souls fall ill as part of their lesson – it’s the only way they can meet certain people (such as doctors and other healers), create authenticity (ex-addicts often become counsellors, speakers and writers – see Jost Sauer), or realise that they are off their purpose (e.g. after cancer many people change careers and relationships). My best advice for people with 9 energy is to keep growing. Don’t fall into the trap of staying the biggest fish in a small pond. People can’t see you if you keep hunching over! Whenever you lose your nerve, go outside. Fresh air breeds fresh ideas. Air-conditioning breeds, um, mould…! When in nature, we remember our infinity. After all, the number 9 looks like a leaf unfolding…at any moment in time, you are either growing, or you’re going extinct. And forgive others – not for their sake, but yours. Using a reflexology idea, when someone is hard to you, they are asking for softness, and vice versa. Hold people to account, but allow them, and yourself, a gentle landing if they fall. Deep down, 9’s know that everything happens for a kind reason, and that there are no shortcuts to enlightenment. It’s like the story of the Three Little Pigs. You can build fast, but it won’t last! Although many 9’s will never be as famous as the people I’ve listed above, every one of them will touch lives in their own way.Here’s a prayer for you: Dear Universe, thank you for taking care of everyone, and everything, everywhere, all the time, WITHOUT my help. Amen (visualise a whirlwind moving up and down your body, removing any stress before disappearing into the sky). I hope you’ve enjoyed my take on 9 Lifepaths. Have fun rewriting history! Oh, and Happy Star Wars Day for May 4th – read more on Star Wars numerology. -Share this with other 9’s. Knowledge is freedom! Please maintain integrity by sending them a link to this article. I’d also recommend the book Compassion by Osho. Hi Sarah, love this post. So well written and very accurate. I really enjoyed the part about being sent to various places (jobs, homes, etc) as this happens to me all the time. I’m almost always sent to a new job with the side job of guiding someone there. Also, thank you for offering this for free. I would be interested in your ideas about why certain people pick up the next days numerology instead of their birthday. I thought it was time zone related but it is not. I also thought it was because they completed challenges of the previous number soon after birth, but that doesn’t work for 36/9s who are 1s (for example).